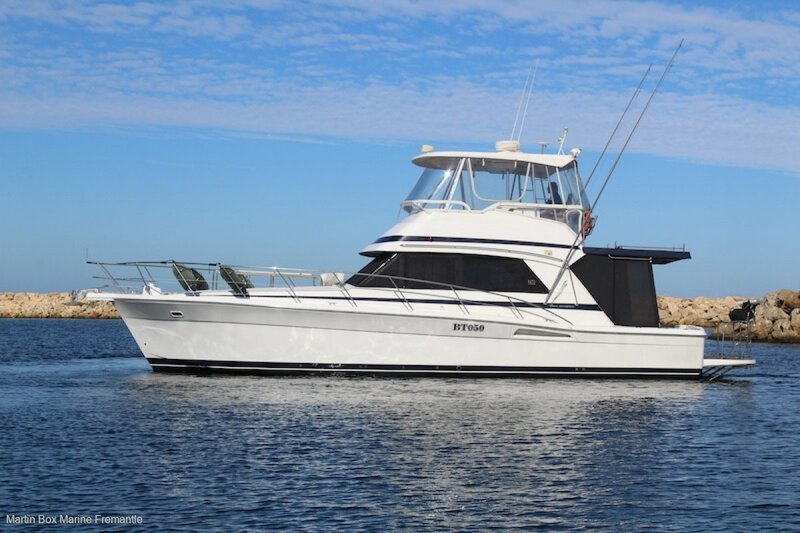 Described as the most highly optioned Riviera 43' ever constructed by many in the know, "Woy Woy" is in a class of its own. The two cabin, two bathroom layout provides luxurious accommodation along with extra sleeping in the flybridge and saloon. Twin Volvo 435Hp TMAD74 EDC engines provide comfortable cruising at 22 knots and 28 knots when asked. Optional extras include a long range fuel tank, game poles, Teak decks, full length cockpit awning and a fore-deck mounted tender davit. The 11Kva Kohler generator powers the onboard systems including airconditioning and an inverter provides power for quiet evenings at rest. The Riviera 43' hull design is well know for it's offshore pedigree and this example is one of the last ever produced. Available for viewing here at our premises in the grounds of Fremantle Sailing Club and highly recommended by our team. Contact Jamie Dodd on 0418819181 to arrange an inspection today. Mezzanine galley with dishwasher and electric appliances. Novacool in Galley and cockpit refrigerated icebox. Queen size island berth and two Singles along with an extra double on the flybridge. Bathroom x 2 & Cockpit showers. Bose and Clarion Stereo along with a Sony flat screen TV. Full length cockpit awning with side shade screens. Muir Electric anchor winch and fore-deck mounted tender davit. Auto Battery Charger, Raymarine VHF, Auto Pilot and Radar, 27 MEG Radio, Raymarine RC80C GPS, Ritchie Compass,, Raymarine L1250 Echo Sounder. The Riviera 43' hull design is well know for it's offshore pedigree and this example is one of the last ever produced.